The majority of activities at the monastery are not very photogenic. For the most part, the work we do takes place inside the mind. Below you will find images of our more public expressions of our practice. 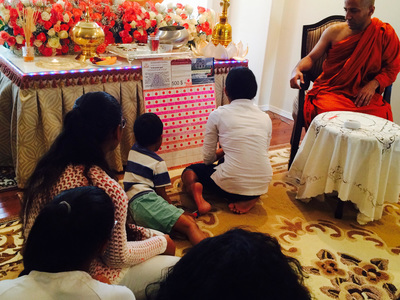 The Great Vesak Program of 2017. 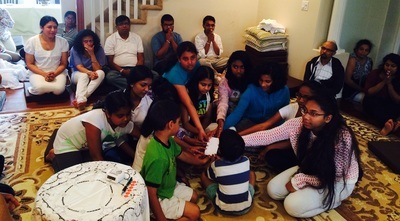 Celebrated Vesak with a pirith chanting. With the great power of the Buddha, Dhamma and Sangha may all beings be well and happy!!! We had a great time by offering a meal to the homeless people in Saskatoon, for the second time. May everyone rejoice in this good karma! Dhatu wandanawa (Exhibition of the sacred Buddha relic) December 31,2016. It had been a great opportunity to pay homage to the sacred bone relic of the Buddha. 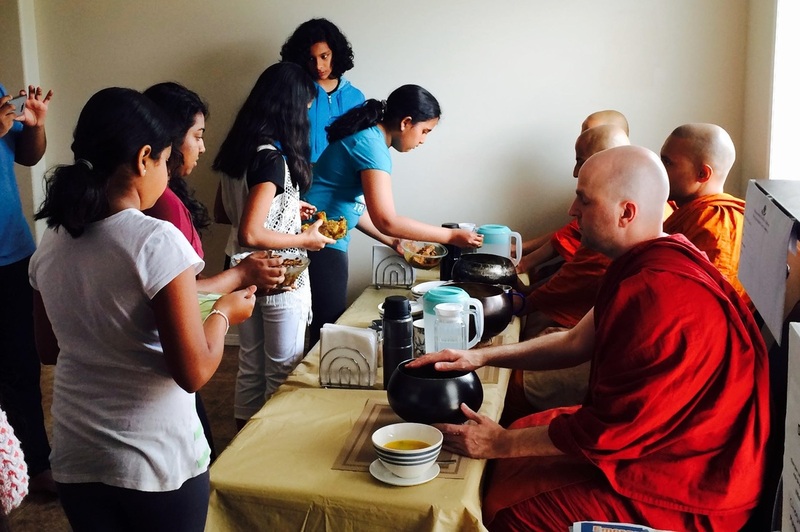 Practicing the Buddha's teachings on generosity and compassion. The meritorious children of the Saskatoon monastery worked together to raise $500 towards the down-payment on the new building. On Sunday they planned a lunch offering for the monks and afterwards presented the money they raised to the Board of Directors. With much happiness they marked their spot on the donation tracking board. Click an image to enlarge. Vesak celebrates three of the most important events in the life of the Buddha Gotama: his birth, enlightenment and passing away. All three happened on the full moon of May. Learn more by reading the captions at the bottom of each photo. More photos from this event are located here. We held a devotional service remembering the seven fully enlightened Buddhas who have lived and taught in the the last 91 eons. The Buddha named Gotama, who lived in our current age, taught about the lives of the six Buddhas who lived before him. All fully enlightened Buddhas have attained the same spiritual development and gave the same teachings. Most of the time no Buddha lives in the world and the teachings are unknown to anyone. We are extremely fortunate to be living in a time when the teachings are still available to us. The founder of the Mahamevnawa (maha may oo NA wa) order of Buddhist monasteries came to Saskatoon in the summer of 2015 to officially open our branch here. We call him Loku-svaminwahanse, which means head monk.